Posted bykaat	 June 9, 2010 3 Comments on Stung! I’ve had my bees for 5 weeks, and I’ve done 8 inspections, and yesterday I did a big one. I pulled out frame by frame, looked at each side for several minutes, spotting patterns, looking for mites and queen cups, just standing in awe of all those hardworking, generous creatures going about their business even as I was ripping their home apart. 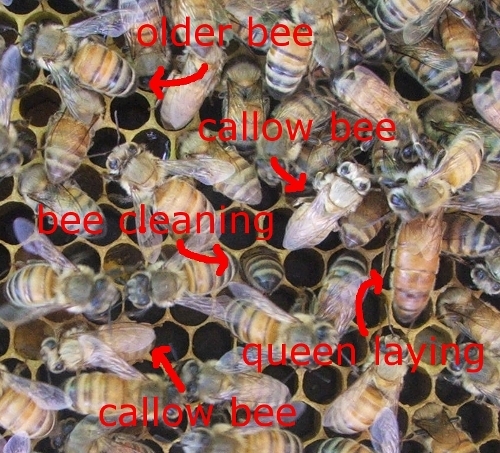 I checked for other insects or mouse droppings in the hive, and removed dead bees, leaves and burr comb. I topped off the sugar syrup in the feeder and checked the Apiguard mite treatment (still needs a couple of days). The queen looked fine, though at some moment the bees were on top of her, 2 to 3 layers deep. I thought: is this balling? But she got out from under them. A friend who started his hive on the same day, with a package from the same dealer, has had his second brood box on for a week now. 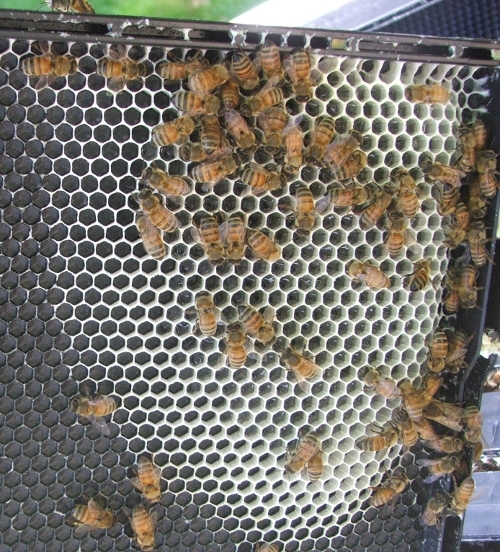 This means that his bees drew out (built out wax comb) across 7 to 8 entire frames. He also noticed a marked explosion of the population. 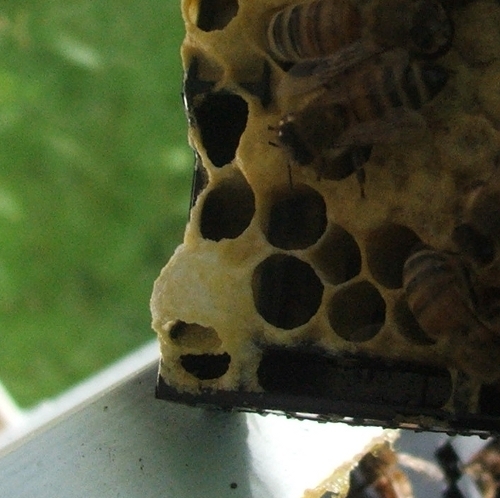 Still, my bees have still to draw out 1 1/2 frames to warrant the second box. I also found two (I think) queen cups under construction (they’re easy to spot as they face down), which may indicate that the colony is not happy with its queen and is preparing to raise a new one. I’m getting a little worried, because they’ll have to draw out 7-8 frames in the second box as well before I can put on a honey super. The honey flow is supposed to be going on right now, so we’re behind. I don’t care if we don’t have honey this year, but I want all the frames drawn out so the next generation doesn’t have to, and the honey supers filled with enough honey so that colony is ready to survive the winter. Well, in any case, this inspection lasted about 40 minutes. 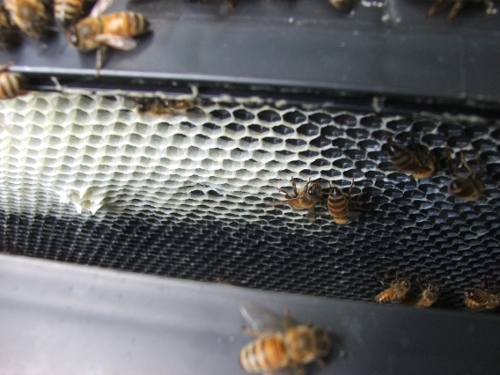 It was a great day: not too hot, though at the end the bees did start fanning inside the hive, getting up a wonderful buzzing sound that signaled that it was time to close up. And I got stung for the first time. I don’t want anyone to blame think badly of my super docile bees, so I want to stress that it was totally my own stupid fault. 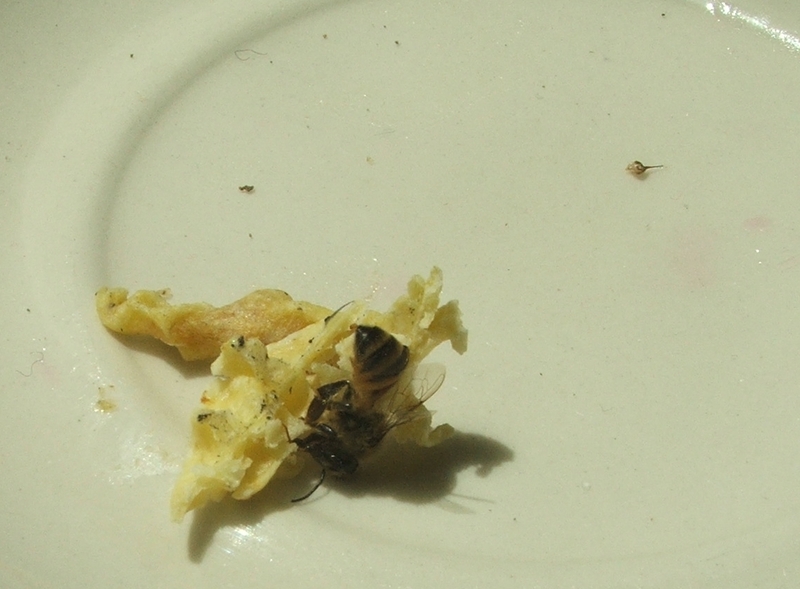 I had scraped off some burr comb with what I thought was a dead bee stuck to it. Back in the kitchen I picked it up to throw it in the trash and yowzah! Right in my index finger top (left hand, but that’s little comfort since I’m ambidextrous). I had forgotten how much it hurt. It took me three tried to scraped off the stinger (with my fingernail) and I marveled at the pumping action of that little venom sack. Then I sucked on it and spat out whatever venom. Then I scoured the internet for remedies. I tried calomine (nope), ice (nope) and onion, which really helped against the pain. So I walked around all day rubbing onion between my thumb and finger. I put the event on my facebook and have recevied several alternative remedies, which I will try next time. We’re exactly 24 hours into the sting and my finger is still swollen, but at least I can type. Ouch! I know next to nothing about bee-keeping, but it looks as though it is going really well. You are so informative with these posts. They are wonderfully interesting and helpful. I suppose that first sting had to happen sooner or later. :( I did read about one beekeeper who deliberately tried to get stung once a day because he believes in the health benefit of the venom. I don’t reckon aloe vera would help. It works for me for poison ivy. Seems to me we used to have a homeopathic remedy called “Sting Stop” when the kids were little. I recall that it worked quite well.